While most people with Alzheimer’s are over the age of 65, Alzheimer’s isn’t a normal part of getting older and shouldn’t be treated as such. It is the most common form of dementia, and Alzheimer’s accounts for 60 to 80 percent of all dementia cases. This disease has no current cure and worsens over time, but there are things you can do to help a loved one who suffers from it lead the most normal life they can. The best way to help a loved one with Alzheimer’s is to get them senior home care in Plano. Here are the top 5 reasons why in-home care is so essential for those suffering from Alzheimer’s and how it improves their quality of life. No one knows your loved one as well as you do, but qualified professionals will get to know their patients extremely well, treating them with compassion and respect at all times. They will develop a care plan according to the current state and symptoms of the patient, adapting it overtime. Since Alzheimer’s is a progressive disease that will get worse as time goes on, the care plan will change as well. Since the home care professional will get to know the patient so well, the care can be catered to his or her exact needs at the time. The home care plan can consist of 24-hour nursing care and administration of prescribed drugs at the correct time of day. If the Alzheimer’s is still in the early stages and constant care isn’t needed, you will be able to use home care services for exactly what you need them for. During the middle and in some cases even the early stages of Alzheimer’s, there are certain safety risks that come with it. These include an increased risk of wandering and getting lost or forgetting medication was already taken and taking it again too soon. There are also many ways a household can become unsafe for an Alzheimer’s patient. With a qualified care professional working with the Alzheimer’s patient, they can anticipate potential sources of harm like slippery surfaces, tripping hazards, and sharp objects, and minimize and remove those risks. In addition, what can be considered a small disruption to some, like a radio or TV, can be extremely agitating to a person with Alzheimer’s. Caregivers will be there to minimize their very presence as well as impact due to their understanding of how an Alzheimer’s patient can be triggered by such factors. Creating a calm environment will help one suffering from Alzheimer’s have a greater sense of safety and peace. Alzheimer’s can cause a person to feel fear in situations where they were perfectly comfortable before. Family gatherings, simple changes to routine, or any other environmental factors can cause withdrawal and isolation. However, home care professionals can help ease these fears by providing calm and constant companionship throughout the day or as often as needed. Keeping a routine or just being there for reassuring conversation will help patients of the disease feel that companionship they long for. Alzheimer’s can cause its victims to forget how to perform tasks that were once easy or routine, and even simple cooking skills can be forgotten. Using knives and kitchen appliances can also become safety hazards as Alzheimer’s progresses, which makes entrusting meal prep to in-home caregivers even more important. With someone else cooking their meals, you can rest assured your loved one will get the proper nutrition needed according to guidelines from their physician, all while remaining safe from harm. Different stages of Alzheimer’s require different levels of assistance, but it’s important to find a home care service who can provide exactly what you need. Whether those needs include transportation to and from doctor’s appointments, light housekeeping, or assistance with bathing and hygiene, the proper care is available for your loved one. While it can be difficult to take the step in getting home care for your loved one with Alzheimer’s, it can be essential for their safety. It is also a great way to show how much you love and care about them. 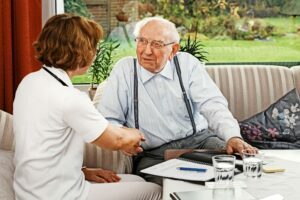 Licensed professionals who are specially trained to care for Alzheimer’s patients can give them exactly the care they need, ensuring the highest level of satisfaction.